Yesterday, Politico's Arena asked what might come of the Obama-Romney lunch. Below is my submission, which was apparently too edgy for the stuffed shirts over at Politico. Mitt and Obama slowly walk away from the West Wing toward the Rose Garden. 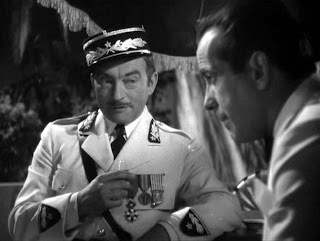 It might be a good idea for you to disappear from Casablanca for a while. There’s an ambassadorship to an international financial institution in Switzerland, I could be induced to arrange your confirmation. My confirmation? I could use a job. But it doesn’t make any different about our bet. You still owe me ten thousand dollars. And that ten thousand dollars should pay our expenses. Barry, I think this is the beginning of a beautiful friendship. By the way, just FYI - Casablanca is Spanish for White House. First, it has to be observed: tens of thousands have been killed in the Syrian civil war but the story is soon buried. A flurry of fighting involving Israel becomes immediate front-page news that requires international attention and high-level negotiators. Is recommending Clinton as a Middle East negotiation a plan by McCain to move Clinton out of US politics, where he has been extremely effective as an advocate and supporter of President Obama? It is difficult to imagine what former President Clinton could bring to a peace process. There is a relatively narrow window for peace agreements (as opposed to cease-fires.) Is Hamas really prepared to crack-down on those who launch rockets, because if they are not then Israel cannot offer them anything. For that matter, does Hamas have demands that Israel can realistically meet? When Egyptian President Sadat travelled to Jerusalem in 1977 he was making a clear and explicit statement that the end goal of achieving peace was his highest priority. Great efforts were still required to make the Egyptian-Israeli peace a reality, and President Carter's personal engagement was essential in making it possible. But the Egyptians had made a profound first step. It is not apparent that this has occurred among Hamas. With that out of the way, I'll offer a few additional thoughts on this sad, sad conflict. But only a few. I've spent substantial chunks of my career on the Israeli-Palestinian conflict, but it is just so painfully sad and - surprisingly peripheral. The deaths of children in war is awful, but there are so many other places where far more terrifying things happen. Further, the deaths of children from disease and malnutrition pervades the world. Rationally, the Israeli-Palestinian conflict is a small, local scuffle (maybe bigger than Ecuador vs. Peru, but nothing like Pakistan vs. India.) As I noted above, tens of thousands have been killed in Syria - shouldn't that matter more? But the Israeli-Palestinian conflict fuels rage throughout the greater Middle East which raises temperatures around the world. It is always important to remember the importance of emotional issues in world affairs. Netanyahu is surely right. Israel’s response to these ongoing rocket attacks is justified. But being justified isn’t the same thing as being smart. The truth is Israel has been engaged in a low-grade war with the Hamas leadership in the Gaza Strip for five years now, with no plan besides a misguided military strategy for how to end it. I'm inclined to agree, but what would a smart strategy in Gaza look like? Sometimes it can be to the advantage of a stronger power to make concessions to a weaker power - and it is fair to point out that the military plays an outsized role in Israeli national security decision-making. But what concessions can Israeli realistically make, would they be enough to induce a change in Hamas behavior or would they merely lead Hamas to the conclusion that violence works? What if those concessions are followed by violence, either at the hand of Hamas or by one of the myriad other uncontrollable factions (the inestimable BJ Tucker gives a brief overview of how Palestinian factionalization hampers cease-fire negotiations. Israeli can accept occasional rocket fire, but serious Israeli casualties or rocket fire near the main Israeli population centers will not be ignored and lead to even harsher reprisals (concessions and tolerance can only go so far). A key part of this narrative is that Mubarak sold peace with Israel on the cheap. In Egypt it is believed that the $1.3 billion that Egypt receives a year in military aid, and hundreds of millions more in economic aid, are just a portion of what Egypt’s adherence to peace is worth. To get more, the plan of the Muslim Brotherhood is to persuade Washington that it can’t take Egypt for granted. The strategy will be to stimulate crises that will be amenable to resolution by the transfer of resources. No one can predict what those crises will look like. It’s hard to imagine that some of them won’t involve Israel. To some extent the same goes for Hamas. Clearly an open recognition of Israel would be a tremendous boon for Gaza. But, as noted above, issues of the heart often trump the "rational actor" theory. But for Hamas in particular, the conflict with Israel is essential to their ability to govern and attract international attention. Without the conflict they revert to being a small corner of a big world. And it does not help that neighbor Egypt now believes its best strategy is to fan the flames with Israel and then take credit for putting them out. A closing thought on this rambling, and sad post. Is the smart strategy a lose-lose? Since the 2006 war, Hezbollah has kept things quiet on Israel's northern border. In the 2006 war, Israel was perceived to have lost. But Hezbollah was hurt badly and recognized that a few more victories like 2006 would destroy the organization. So Israel won by losing - giving Hezbollah the public victory while letting them know that Israeli capabilities remained extremely formidable. With this image of victory, Hezbollah has been able to keep its border quiet and refrain from future attacks on Israel. (Perhaps the same could be argued about the relationship between the Yom Kippur War and Sadat's willingness to make peace a few years later.) But it is tough to see how Israel could throw one to Hamas. Nonetheless, it is food for thought. But the outside Briton who takes a delight in politics,—and this description should include ninety-nine educated Englishmen out of every hundred,—should not be desirous of peeping behind the scenes. No beholder at any theatre should do so. Whether or the administration made a major mistake in its handling the attack on the Consulate in Benghazi is an open question. To this observer, it appears that on a tough play they bobbled the ball. An investigation is in order, but hopefully to improve processes and crisis management. But the question of Ambassador Rice's role in this is fairly clear. There was not one, the UN Ambassador has little to do with Embassy security or counter-terror response. Her mistake was being the administration spokesperson at the wrong time. So what are Senators McCain and Graham, a pair of experienced foreign policy hands, up to in their criticism? They may simply be scoring political points, but even this is not as simple as it seems. Now that the President appears to have a strong majority in the Senate, McCain needs to let the President know that he stills needs to consult the Senate on foreign policy issues - a shot across the bow, as it were. Another possibility is that Senators McCain and Graham are uncomfortable with Amb. Rice as Secretary of State and the Benghazi issue is a convenient hook to this issue. There can be little doubt that Amb. Rice is an extraordinarily capable person. But most of her experience is in African affairs and at the UN. While these are important arenas, they are not central to American foreign policy. Further, the Senators were reportedly unhappy with Amb. Rice's performance as UN Ambassador. These are legitimate arguments, but they make for poor theater. The resignation of CIA Director David Petraeus provides the Obama administration and Congress an opportunity to take a hard look at what the agency does and what it needs to be doing. Particularly the use of unmanned aerial drones. In recent years, the CIA has effectively become the Department of Drone Strikes. There are important and difficult legal debates about the use of drones. There are also questions about their efficacy. The use of drones has been an important tool in American efforts to counter-terror around the world. But their use is not without consequences. Drone strikes appear to exacerbate instability in Pakistan and a drone strike that killed many civilians appears to have helped set off violence in Yemen. Beyond specific instances of reactions to drone strikes, they may not be the most effective counter-terror tool. The CIA and administration would be wise to heed the old adage, "When you have a hammer, every problem looks like a nail." The fact that the president has an enormous bureaucratic and technical apparatus at his disposal to deliver these strikes creates incentives to do so. But this may come at the expense of other useful tools. For example a recent study I co-authored that used a sophisticated computer model to analyze the behavior of the Pakistani terrorist group Lashkar-e-Taiba, perpetrators of the 2008 Mumbai assault and a major international security threat, found that fostering internal dissent may be a more effective approach to reducing the organization's violent activities then traditional military counter-terror tools. Even more creative would be identifying key members within a social structure and encouraging them to become U.S. supporters or at least be neutral. These approaches would require a great deal of creativity and take longer for bring benefits then drone strikes, but they have enormous long-term potential to provide sources of intelligence and influence. These strategies would require creative thinking. The CIA had shown a great deal of creative thinking in the past few years. The raid that killed Osama bin Laden was one example; another was the effort to track down Yemeni al-Qaeda chieftain Anwar al-Awlaki. Adopting a more subtle approach is well within the CIA's capabilities but it will not offer the quick political pay-off of drone strikes. General Petraeus' exit from public life is a sad end to an otherwise impressive career. But it creates an opportunity to take a hard look at the operations of an agency central to the American counter-terror efforts and to re-shape it towards longer-term needs. Last week a bit of business took me to the Twin Cities. I had never been there before so was determined to fit as much sightseeing (around my work of course) into my brief trip as possible. I have to say, it was really neat. Russian Roulette was a Russian Imperial Stout made with Belgian chocolate. It really nailed the concept of chocolate beer. Suffice to say, the last thing I did before heading to the airport was swing by for another glass. No doubt this colored my attitude towards everything I saw in the Twin Cities. So be it. The Twin Cities are home to some terrific architecture and (I'm sure this is a travel writing cliche) the two cities are distinct. St. Paul is home to older buildings, such as the endless row of Victorian mansions along Summit Avenue or the imposing and beautiful St. Paul's Cathedral. Minneapolis, on the other hand, features work by renowned modern architects such Frank Gehry and Cesar Pelli. I don't know quite how I learned of it but there is a famous Stone Arch Bridge across the Mississippi. Originally built for trains it is now a pedestrian walkway. I wanted to walk across the Mississippi and when I saw the bridge from my hotel window, I knew the Stone Arch Bridge was my path. As it happens, this bridge sits at the locus of Minneapolis history. Just above it are St. Anthony's Falls, the only falls on the Mississippi. In the mid-1800s the falls were harnessed to run lumber and grain mills. Minneapolis became the grain mill capital of the world. I thought, someone should write a book about how these falls made the city, and sure enough someone did. On both sides of the river are old mills (these aren't cute little fairy tale buildings, but instead are enormous factories.) Some have been converted to condos, there is also the neat looking Mill City Museum. But the city is doing something pretty neat, converting the area to a giant archeological park the Mill Ruins Park. I am a sucker for ruins. Anyone can fall for the romance of a ruined abbey or the remains of an ancient temple. The giant mills are not so old and they were built for efficiency, not beauty. Still, they too harnessed massive power and were in their sphere a pinnacle of achievement. People's lives and dreams were shaped within and around these walls as surely as they were in the Parthenon or at Machu Pichu. Both campaigns appear to have made effective use of "big data" analytics, computational tools and capabilities that are having a profound effect on modern life. Both campaigns excelled at raising money. But, as the old adage goes, no matter what the marketing campaign you can't sell dog food if dogs don't like it. That leaves the fundamental question of the competing narratives of the two campaigns. Here, Governor Romney had a tremendous talent for making serious, considered arguments in a way that annoyed the general public rather then persuading them. Two of his most famous mis-steps, calling corporations people and saying that he likes to fire people fall into this category. These are serious arguments. In the first case Romney was replying specifically to calls to raise corporate taxes and more broadly to the idea that there are magic pots of money that could easily be obtained and solve America's problems. Corporations are owned by and employ people, if their taxes are raised they have less money to hire employees and develop products. This reduces their value which effects stockholders, category that includes billionaires, but also charitable foundations, pension funds, and college savings accounts. This is a serious point, but it came out all wrong. Interestingly, there was another case of this in the second debate. Not the famous "binders" statement which in content was utterly innocuous (Romney was merely doing exactly what anyone would want him to do, which is to seek out and hire qualified women.) Granted it sounded strange. Romney's goof was in the question on gun control in which he talked about single mothers. Here again, there was a serious point. Time and again research shows that children in two parent families overall have far better outcomes in terms of education and behavior. This is not that single mothers are not good people - it is that parenthood is difficult and two parents are almost always better then one. The break-down of the traditional family is a serious issue and Romney was not wrong to raise it (although as a conservative one must be very humble about what can actually be done about it.) But again, the way in which Romney articulated a serious issue came off as insensitive. Ronald Reagan had a talent for making these kinds of arguments through anecdotes without offending people (except those who were inclined to dislike him anyway), but this is not easy to do. Where Reagan was the master of the narrative, Romney is much more the master of data - a worthy skill but not necessarily what the American people are seeking.